Melissa tells Sharon that she's falling for Matt. Baby Rhys is taken away by the adoption agency. Sharon flounces in and ignores Bronwyn. Bronwyn apologises for over-reacting before and Sharon insists that she was wrong about her - she hasn't been sleeping around. Sharon says cryptically that Bronwyn is the last person to be judging on "how things look". Just then, Madge and Harold arrive back from the airport - the plane was overbooked! Gloria, Lee and Melanie chat about Melanie's clairvoyant. Gloria thinks that they're a load of charlatans but Melanie protests that Madame Zelda is very accurate! She tells Gloria about her secret admirer. They tease Lee about her relationship with Matt. In the kitchen, Gloria asks Lee casually about her folks, but Lee is very evasive. Beverly has gone for a lie down. Jim tells Helen that he blames himself, but Helen says it's no-one's fault. Beverly will just need a bit of time. Beverly comes out at that moment and Jim tries to make smalltalk about Matt. But Beverly doesn't want to be tiptoes around - she has to get used to Rhys being gone. Beverly tells Jim that she doesn't blame him for what happened - she just wants to put the whole thing behind her. Des is telling Paul that his course has put him in touch with his emotions(!) Long-suffering Paul listens to him witter on - now Des wants to go on another course. Paul warns Des not to make the same mistake he did with Gail - he should put Jamie first. Des tells Paul that he's put his name down for a weekend introductory course - Paul nearly chokes when he tells him it's $1,000! Gloria is imposing her ways on Lee in preparing and serving food. Lee isn't impressed and would rather stick with Harold's way of doing things. Just then, Harold comes in to help out since he and Madge can't leave until the weekend. Gloria asks Harold if she can add her home-made casseroles to the menu. Harold says that it's OK as long as she isn't too outlandish. Lee rolls her eyes. Bronwyn and Sharon are still being frosty with each other. 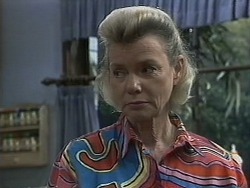 Bronwyn gets fed up with Sharon's sniping and goes round to see Melanie. Des is teaching Jamie to be "in touch with himself"(!) Bronwyn arrives and chats with Melanie in the kitchen about her secret admirer. Des looks interested but Melanie quickly shushes Bronwyn. 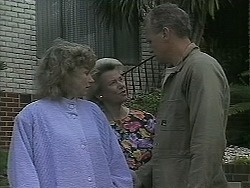 Bronwyn tells Des about her fight with Sharon. He says that the answer is to "deal with anger" as he learnt on his course(!) He suggests a primal scream will help. They jump as Melanie suddenly tries out a primal scream herself! MELANIE: Wow! That feels fantastic! Jim is just off to work while Beverly debates going back to work herself. 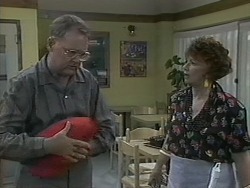 Jim tells Helen privately that Beverly is being very strong, but Helen doesn't look convinced. Lee is trying out Gloria's casserole which she thinks is a bit bland. Sharon comes in and moans to Lee about Bronwyn "bossing her around". Gloria is appalled when Lee gives Sharon a fruit salad on the house. She tells her off, telling her that it's really stealing, and Lee had better not let it happen again! Beverly is ont he phone arranging to go back to work. 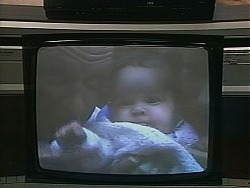 When she gets off the phone, she puts in a family video which has Rhys on it. She smiles at first, but as the camera zooms in on Rhys she quickly turns off the video. Jim comes home from work to see how Beverly is. 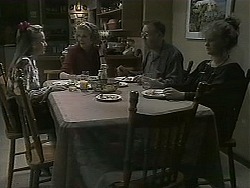 He suggests that Beverly takes a break - to go to Adelaide and see her sister and Katie. But Beverly is adamant that she's going back to work tomorrow. Jim is worried that Beverly is going to run herself into the ground. Sharon is sniping at Bronwyn again. Bronwyn says that Sharon should apologise to her - she's been acting like a child. When Sharon refuses, Bronwyn tells her to pack her things and move back in with Hilary - she's had enough of Sharon's petulant behaviour. 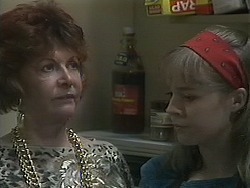 Lee and Gloria are also having a row in the kitchen - Lee's fed up of Gloria bossing her about. Harold comes into the shop with Paul and Des and is appalled to hear raised voices in the kitchen. Paul steps in and tells them to stop their juvenile behaviour. Harold tells them that if they can't behave, they'll both be sacked.